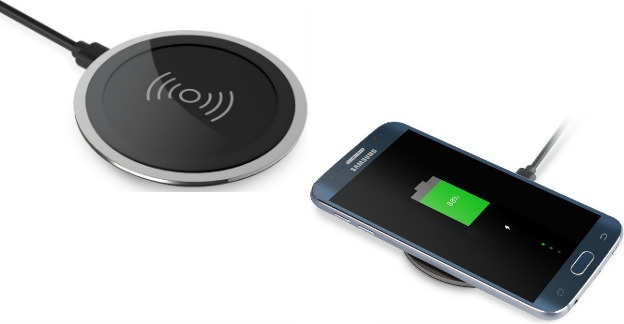 1byone sent me a wireless phone charger and I have to say I love it! Hubby bought one a year or so ago from T-Mobile and I wanted one of my own! I love that you can just lay your phone down and it charges it. So, it sits on my desk and I can just lay my phone on it and it will charge and quickly, too! I mean, it’s just laying on my desk anyway – why not lay on a charger so I am always charged up? I really am happy with it. If you have been wanting one they are much less expensive now than when Hubby got his. You can get one just like mine for just $15.99 – down from $39.99! Simplest Way to Charge Your Phone – Just place your phone on the station and it will charge. It’s a breeze! There is no electrical discharge or safety issues to worry about. And you don’t need to unplug a cable when you get a call. Input: 5V/2A; Output: 5V/1A. The Perfect Way to Charge Your Phone – This charger has an integrated temperature control setting which will never heat your battery over 107 Fahrenheit. It will also stop charging if the battery is fully loaded. This greatly reduces battery capacity loss over time! Compact and Sleek Design – This tiny black station will replace your messy cables. Additionally, it is really a new piece of technology delivered right to your doorstep. Size: 3 x 3 x 0.4 inches. Compatible Phones – Samsung S7 / S6 / Edge / Plus, Note 5, Nexus 4 / 5 / 6 / 7, Nokia Lumia 920, LG Optimus Vu2, any Qi-Enabled Devices or Device Equipped with a Qi Receiver. iPhone 6 & 6 Plus will need a Qi wireless receiver patch or a Qi wireless receiver case. Buyer Guarantee – 12-month hassle-free warranty, 30 day money back guarantee and friendly customer service.